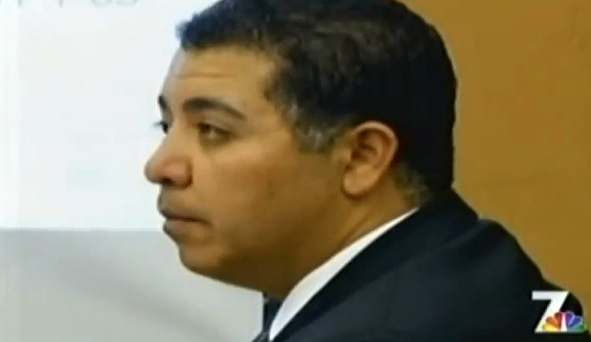 A federal judge Monday ruled that the city of San Diego is liable for the actions of a former patrol officer convicted of sexually assaulting a woman in a 7-Eleven bathroom, clearing the way for the damages phase of trial. U.S. District Judge Michael Anello granted the summary judgment in a lawsuit filed by Anthony Arevalos’ main accuser, referred to only as Jane Doe. Arevalos was convicted in November 2011 of felony and misdemeanor charges of sexual battery, asking for a bribe and assault and battery by a peace officer involving five women he stopped in the Gaslamp District. Jane Doe was assaulted after Arevalos pulled her over near downtown on suspicion of DUI. The City Attorney’s Office said in a statement that Monday’s ruling was not a surprise and Jane Doe’s lawsuit is about the amount of money she will be paid, since both sides couldn’t agree on a settlement amount. The city of San Diego has paid a total of $2.3 million to 12 other Arevalos victims because the city recognized its responsibility, according to the City Attorney’s Office. A jury trial is scheduled July 8 to determine the damages in Jane Doe’s case.